According to Catholic tradition, Saint Linus (d. c. 67 - 80) was the second bishop of Rome, succeeding the first "pope," Saint Peter, after Peter's martyrdom. Modern scholarship, however, holds that Rome did not yet have a single ruling bishop at this time, and the Roman church had not yet emerged as Western Christianity's administrative center. Nevertheless, Linus and his colleagues at Rome were probably instrumental in guiding the Roman Christians to cope with the reality of persecution and the possibility of martyrdom. 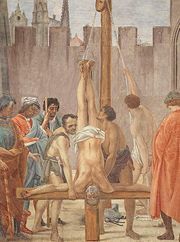 The spiritual vision of Christian suffering later spread to Christians throughout the Roman Empire and was enshrined in Christian literature from the Gospels to the stories of the later martyrs. The earliest sources do not agree with one another concerning Linus' dates and his position in the order of the early Roman bishops. Some place him immediately after Peter, while others place Clement of Rome before him, and still others hold that Linus was actually the first bishop of Rome, being appointed by Saint Paul to that office before Peter came to Rome. The Liber Pontificalis attributes to Linus a decree that women must wear a veil in church, and one manuscript states that he was the first to institute the mass as a commemoration of Jesus' passion. The same source also designates him as a martyr, although other earlier sources do not, and he is not listed as such today in Roman Catholic tradition. His feast day as a saint is September 23. His death is indicated as early as 67 and as late as 80 C.E. Some sources indicate that he was succeeded by Clement of Rome, while others say Anacletus. Little is known of Linus' early life. However, the Liber Pontificalis relates that his original home was in Tuscany in western Italy north of Rome and that his father's name was Herculanus. It is not known how he came to become a Christian or who taught him the Christian faith. Linus would probably have lived through the Great Fire of Rome which erupted in July, 64 and which Emperor Nero blamed on the Christians. The fire completely destroyed four of 14 Roman districts and severely damaged seven. The Roman historian Tacitus describes Nero as extensively torturing and executing Christians after the fire, and Suetonius praises Nero for punishing Christians, though not in connection with the fire. Tradition holds that both Saint Peter and Saint Paul were among those who were martyred during the Neroan persecutions. After the Holy Apostles had founded and set the Church in order (in Rome) they gave over the exercise of the episcopal office to Linus. His successor was Anacletus. Irenaeus also relates that Pope Linus is the same Linus mentioned by Saint Paul (2 Timothy 4:21) as joining Paul in his greetings to Timothy: "Eubulus greets you, and so do Pudens, Linus, Claudia and all the brothers." Critical scholars point out, however, that Irenaeus is anything but objective in his account, the primary purpose of which is to uplift the idea of a single bishop ruling over each church, as the repository of apostolic authority. Other ancient sources indicate a collective leadership at Rome during this time, involving a group of elders, referred to either as bishops or presbyters. Linus's term of office, according to the papal lists that follow Irenaeus' lead, lasted 12 years. The Liberian Catalogue specifies 12 years, four months, and 12 days, giving the dates as 56-67 C.E. The Liber Pontificalis corroborates this, speaking of his reign as lasting from the consulship of Saturninus and Scipio through that of Capito and Rufus. This, however, presents a problem for Catholic tradition, since Peter himself was thought to have reigned as pope at Rome until his death c. 64. The crucifixion of Saint Peter. Some Christian writers of the fourth century thus held the opinion that Linus headed the Roman church during the life of the Peter. The Apostolic Constitutions, for example, says that Linus was the first bishop of Rome and that he was ordained by Paul. It also states that he was succeeded by Clement, who was ordained by Peter. Catholic tradition, however, holds that Linus' pontificate dates from the year of the death of Peter and Paul, which are not known for certain. Jerome dates Linus' reign to 67–78, and Eusebius of Caesaria dates it to the second year of the reign of Titus (80). The Liber Pontificalis relates that Linus issued a decree "in conformity with the ordinance of St. Peter," that women should have their heads covered in church. Paul's First Epistle to the Corinthians (11:5) may be the actual source of this rule, which was apparently later attributed to Peter and Linus. Liber Pontificalis also reports that Linus himself ordained 15 bishops and 18 priests, although, once again, these offices may be anachronistic. One manuscript of the Liber even claims that it was Linus who "first ordained the celebration of the mass to commemorate the Lord's passion." Beyond the uncertainty regarding the dates of Linus' "reign" and death, a question also exists as to the manner in which he died. The statement made in the Liber Pontificalis that Linus suffered martyrdom is not corroborated in the earlier sources. He seems to have survived the persecution of Nero; and between Nero and Domitian there is no mention in the sources of any persecution of the Roman church. Irenaeus mentions only Telesphorus as a martyr among the early Roman bishops of whom he was aware (1. c., III, iv, 3). A late second century feast of martyrs does not mention Linus among the Roman saints so honored. Finally Liber Pontificalis asserts that after his death, Linus was buried in the Vatican beside Saint Peter. It is considered possible that the earliest leaders of the Roman church were indeed buried there, but there is nothing in the liturgical or other traditions of the church to corroborate this. In the early seventeenth century, when church workmen were digging near the present tomb of Saint Peter, several sarcophagi were uncovered, among which was one thought to bear the word LINUS. However, it was later determined that this was probably part of a longer name such as Aquilinus or Anullinus. 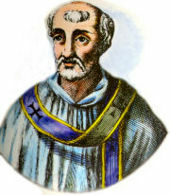 In the late nineteenth century, the Italian archaeologist Giovanni Battista de Rossi determined that the site of the tomb makes it impossible for it to be the tomb of Linus. Although Linus' specific role in guiding the persecuted church at Rome is not certain, the spiritual vision of Christian suffering that evolved during this period would become a crucial feature of the emerging Christian religion. It would soon spread to Christians throughout the Roman Empire through Christian literature from the Gospels to the Book of Revelation and the stories of the later martyrs. In Catholic tradition, Linus is listed as an early saint and pope, but is not designated as a martyr. The feast of Saint Linus is celebrated on September 23, which is also the date of his death given in the Liber Pontificalis. An epistle on the martyrdom of the apostles Saint Peter and Saint Paul was once attributed to Linus and was supposed to have been sent by him to the Eastern Churches. It is now thought to be apocryphal and of a later date. A tradition also holds that the "Claudia" mentioned by Saint Paul along with Linus was actually Linus' sister. A British Israelite legend identifies this Claudia with the historical Claudia Rufina, a woman of British descent who lived in Rome in the 90s and was noted for her beauty, education, and fertility. Both Linus and Claudia are said to have been children of the Iron Age Brythonic chieftain, Caratacus. ↑ Tertullian, On the Prescription of Heretics, Chapter XXXII. Retrieved November 25, 2008. ↑ CCEL, Apostolic Constitutions 7.4 Retrieved November 25, 2008. This page was last modified on 15 May 2015, at 16:36.